Ever wished that your photographs of fish looked as pretty as the fish themselves? We probably all have. Here are some of the things I think about when photographing fish. Perhaps you’ll find value in them too. Foremost in my mind is an appreciation for what the fish have provided in the way of sport. If I’m going to ask for their picture as well as for the excitement of their capture, I feel a responsibility to accord them a certain measure of respect. I try to show them off in a pleasing manner. I try to make the photograph about them, and not about the angler or about me as the photographer. No hero shots, no funky poses, no unusual lens effects. Photographing fish by yourself is difficult. And it can be hard on the fish. It’s better to seek the help of a friend. Both you and the fish will be glad you did. Focus the camera on the eye of the fish. If the eye is sharp, everything else in the photo—sharp or not—will appear acceptable. If the eye isn’t sharp, nothing about the photo will look good. Do not remove the fish from the water until the camera is ready. Limit the time the fish is out of water to 3-4 seconds. If you wish to reshoot, put the fish back in the water between pictures. Holding a fish with the front hand facing palm out and the back hand facing palm in (as in the photo below) shows off the fish in an attractive manner. Whenever a fish is held with two palms out it’s awkward looking, for us and the fish. And invariably, too much of the fish gets covered over by hands. As much as possible, keep the thumb and palm of your front hand hidden behind the fish. Doing so provides an uninterrupted view of an important body line. Same goes for the fingers of the front hand; keep them out of view as best you can. I like the back hand as far back as possible while still supporting the fish. 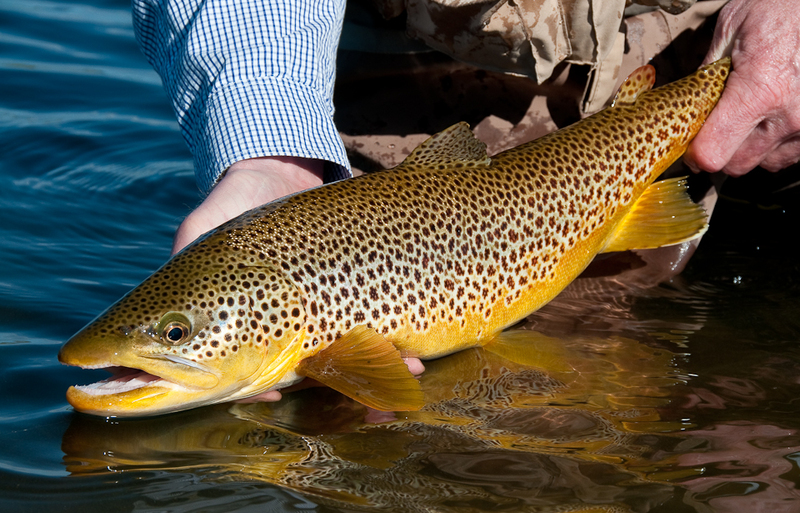 Try holding fish smaller than 16″ in one hand. I think they look best that way. Hold the fish no higher than an inch or so above the water. This is good for the fish in case it slips from the hands, and it also maintains a visual connection between the fish and its habitat. Isolate the fish from its environment and you’ll end up with a photo of—forgive me here—a fish out of water. Consider, too, getting the camera down to the fish’s level; it’s a more pleasing perspective than shooting from high overhead. This isn’t everything involved with photographing fish, but it’s a start. Give these suggestions a try and I think you’ll find your pictures to be respectful of the fish and eye-pleasing to boot.